Kyle Wyman (33). Photo by Brian J. Nelson, courtesy of Pirelli. DAYTONA, Fla. – Pirelli Tire North America and Kyle Wymanemerged victorious on Saturday in a nail biter finish at the 78th Daytona 200 at Daytona International Speedway. Due to an incident on Lap 53 resulting in a red flag, the 200-mile endurance race evolved into a four-lap shootout and Wyman proved to be unstoppable on his N2 Racing / KWR Yamaha equipped with Pirelli DIABLO™ Superbike slicks. A move by Wyman coming out of the chicane on Lap 57 allowed him to take control as he raced to the checkered flag. A Daytona compound was offered to all Pirelli riders competing in the event and was used on the rear tire of Wyman’s Yamaha YZF-R6 in 200/60-17 sizing, while a 120/70-17 DIABLO™ Superbike SC1 was chosen for the front. Wyman opted to run the same tires in qualifying and racing and was just .02 off of the qualifying record time. 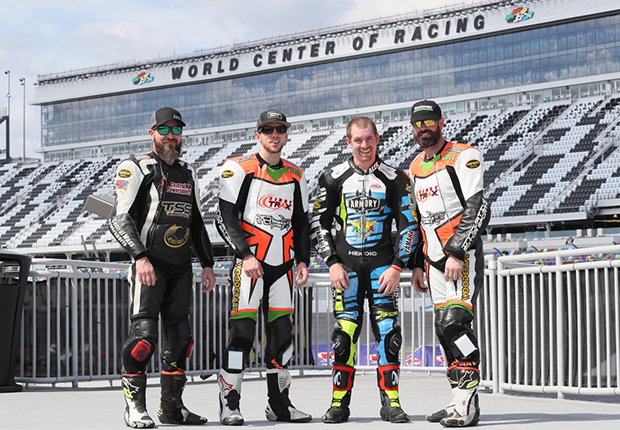 Five Loudon Road Race Series riders competed in the 78th Daytona 200 on Saturday and are eager for the 2019 Loudon Road Race Series season opener at New Hampshire Motor Speedway April 27-28. 96th annual Loudon Classic – the longest-running motorcycle race in the United States – on the 1.6-mile road course at New Hampshire Motor Speedway. Over the years, LRRS has developed a reputation for having some of the closest and most intense racing on two wheels. A strong commitment to rider training and development has contributed to the quality of the LRRS program. Penguin Roadracing School brings some of the most experienced coaches in the nation to NHMS to host classes for everyone from street riders to top pros before each LRRS event. Tickets start at just $5 for juniors (ages 12-17) and $10 for adults and can be purchased at the Operations window at the Main Entrance at NHMS on the day of any LRRS event. Kids 11 and under are free with a paid adult. The ticket also includes entry to the MOAT Mountain Road Course Series, which puts Legends cars on the road course. Round Three: June 15-16 *96th Annual Loudon Classic.